Wat Pho or Wat Phra Chetuphon Vimolmangklaram, as it's officially known, is an old 17th century Bangkok temple on the banks of the Chao Phraya River. 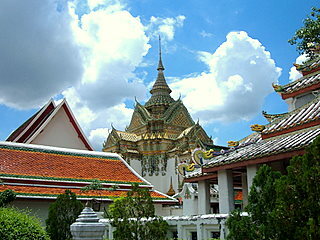 This wat in Bangkok is famous for its huge reclining Buddha that’s a sightseeing favorite for visitors to the old city. Built since the Ayutthaya days, long before Bangkok was established as the capital, the temple must have caught the eye of King Rama I when he chose the site to the north for the Grand Palace. King Rama I recognized in the early days the significance of the two temples, which flanked the Grand Palace site from the north and south. Wat Salak or Wat Mahathat, as it's called today, to the north and Wat Pho to the south. 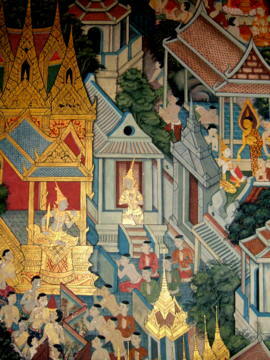 After the Grand Palace was completed in 1782, King Rama I enlarged and renovated the temple. The event was meticulously chronicled and records show that it took seven years, five months and 28 days. It was completed in 1801. Wat Pho was expanded further in 1832 during the reign of King Rama III who also ordered the construction of the huge reclining Buddha. A library to record practice of traditional medicine was established laying the groundwork for a center of learning. 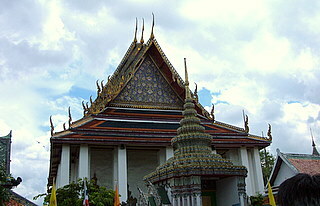 The temple and the reclining Buddha was the cause for marvel by many of the early western visitors to Bangkok in the 19th century. 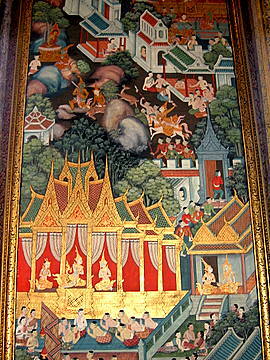 In the reign of King Rama V, the Pali-Sankrit medical scripts were translated to Thai, further developing the practice of traditional Thai medicine. Today, Wat Pho is a huge sprawling complex of more than 20 buildings and structures covering an area of 20 acres or about 10 hectares. The temple complex is walled in on four sides with entrances at each side. Giant Chinese warriors flank the doorways. Several Chinese statues also line the outside of temple buildings, a reflection of the Chinese influence during the reign of King Rama III. Let's take a tour of some of the main structures in this temple complex (Please refer to the map of the temple layout). The first time visitor could find this huge area a bewildering labyrinth of buildings, chedis and cloisters. Just a brief orientation, Maharat Road, nearer to the Chao Phraya River, is to the west. If you're coming by boat, stop at Tien Pier and use the entrance on this side. Sanam Chai Road is to the east. The north is bounded by Thai Wang Road and the south by Chetuphon Road. We'll start with the ubosot or main chapel, where the principal Buddha statue is kept. The golden statue is in a sitting position atop a 3 m high golden pedestal. The ashes of King Rama I are kept beneath this pedestal. 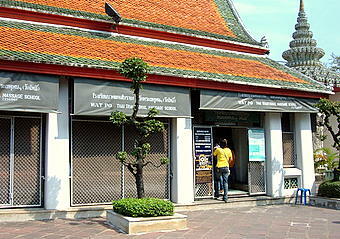 Next the Temple Museum which is just behind the ubosot or main chapel. 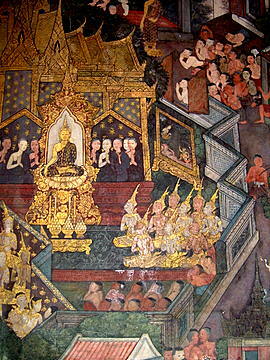 In 1988, during the restoration of Wat Pho, officials found holy relics enshrined within the Chedis dedicated to the Four Kings. These priceless relics were duplicated, the copies were returned to the chedis while the originals are displayed in the Temple Museum. You can't miss the chedis dedicated to the Four Kings, four huge round pagodas built to commemorate the reigns of King Rama I (green), King Rama II (white), King Rama III (yellow) and King Rama IV (dark blue). Chedis are round pagodas while prangs or stupas (sa-tup) are pagodas with rectangular or square bases. Both versions are tiered, embedded with colored chipped tiles and taper to the top. Our next stop is the Phra Mondob or Scripture Hall near the western wall. This building is walled in and has displays of Buddha statues, old ceramics and glassware and traditional Thai books written on palm leaf manuscripts. 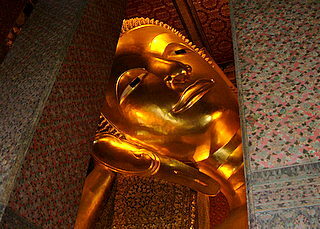 The center of attraction for most visitors to Wat Pho, is the Vihara of the Reclining Buddha. (at the north western corner of Wat Pho.) 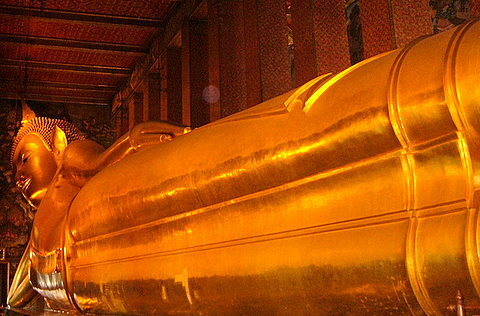 This golden reclining Buddha is 46 m long and 15 m high, each foot is 3 m high and 5 m long! There's another masterpiece of art within this vihara (vi-harn) that's rarely noticed by visitors who are usually enthralled by the gigantic reclining Buddha. These are the intricately drawn murals adorning the inner columns and walls. The murals on the walls reach right up to the roof 30 m above. The murals, which are almost 200 years old, tell an epic tale based on ancient Ceylon (present day Sri Lanka), of royal battles, court intrigues, personal love and jealousies. In 2000, owing to deterioration through time and weather, a complete restoration effort was made. By early 2007, the job was done in time to commemorate the 80th birthday of His Majesty the King. Lastly the School for Traditional Thai Massage (building on the east near Sanam Chai Road) preserves an ancient skill for which Wat Pho is renowned. Massage services are also available for those visitors with aching feet. 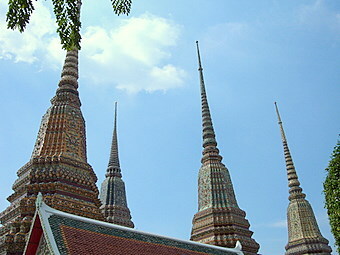 Wat Pho, one of the oldest temples in Bangkok, preserves the legacy of the first four kings of the Chakri dynasty and is a rich repository of Thai art, culture and knowledge. As at 30 September 2007, the restorations of the temple buildings are still incomplete. Work is still being done on the ubosot or main chapel and one of the four chedis. We'll be bringing you pictures of these structures once the work is completed. By early November 2007, most of the major restoration work was done and we bring you the photos that we were unable to take earlier. 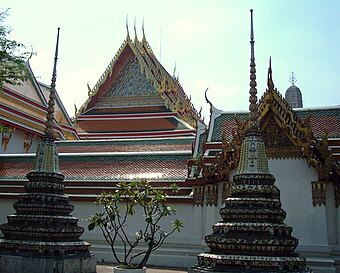 The temple is to the south of the Grand Palace. 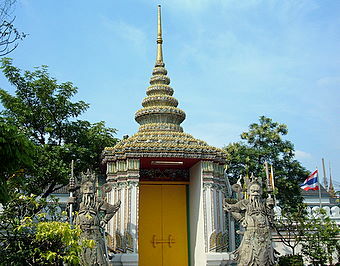 Take a Chao Phraya river boat to N8 Tien Pier, which is just by the temple.